The author examines the iconography of the Parables of Christ for the first time in a systematic manner. The study includes all 27 illustrated Parables from the 46 ones mentioned in the Gospel books. They appear in Greek, Armenian, Georgian, Syrian, and Coptic-Arabic works of art. They mainly decorate manuscripts, mostly Tetraevangelia, Lectionaries, Homilies and Psalters. In a lesser degree, they embellish monumental painting and other objects of art. The study of the relation between text and picture leads to a division of the iconography into a narrative and a symbolical type. The former type is as expected based on the text of the Gospels, while the latter one is influenced from the writings of the church fathers. The symbolism is occasionally so strong, that almost nothing recalls the text of the parable. The preserved narrative scenes are usually older than the symbolical ones. The latter appeared sporadically in the 11th century, gradually increased in number and finally surpassed the narrative scenes. However, the presence of pure symbolical representations in the 6th century makes it possible, that both types already existed since the early Byzantine period. The churches decorated with Parables chiefly date from the 14th century and later and are mainly built in Serbia and Crete. Their presence in Serbia is explained by a particular liturgical practice, and it is in this region only that one can speak about Parable Cycles. In Crete, they mostly appear in relationship with depictions of the Last Judgment. Open remains the question, whether the Parables were depicted in lost churches of Constantinople. CONTENTS: Vorwort, Einleitung, I. Ikonographie der Gleichnisse, II. Die Kontextuelle Verwndung der Gleichnisse (1. Die Parabeln in ikonographichen Programm Byzantinischer Kirchen, 2. Parabel-Darstellungen in der Buchmalerei), III. Zusammenfassung, IV. Katalog, Register, Bibliographie, Abbildungen 1-257. Bound 24x17 cm., 576 pp. (480 pp. text plus 214 illustrations in full colour and 43 in black and white). 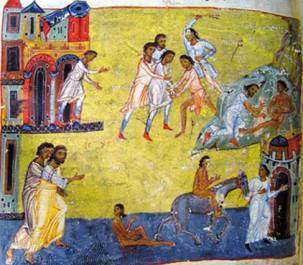 The Good Samaritan, Tbilisi, Institute of Manuscripts, Cod. H 1667, fol. 158v.